Terminal LCD displays are witnessing a rapid surge in their demand, thanks to the technological advancements. The advent of connected devices and advanced mobile technologies are projected to augment the adoption of these displays significantly in the coming years. The rising preference for home automation display panels among consumers is also anticipated to boost the demand for these displays across the world in the near future. Transparency Market Research estimates the opportunity in terminal LCD displays, worldwide, will rise at a CAGR of 4.30% between 2015 and 2022 and increase from US$13.09 bn in 2014 to US$18.50 bn by 2022. HMI industrial products, medical equipment and diagnostic products, home automation products, and retail sector products are the key application areas for terminal LCD displays. Predominantly, medical equipment and diagnostic products are the foremost consumers of these displays. In 2014, the segment held about 40% of the overall demand for these displays across the world. Technical advancements in the medical and healthcare industry have resulted in the immense rise in the usage of displays in various medical devices. As terminal LCD displays are far efficient than their various counterparts, their demand is increasing leaps and bound in this segment. Analysts project the application of these displays in medical equipment and diagnostic products to remain augmenting during the period from 2015 to 2022 at a CAGR of 4.60% and reach an opportunity worth US$8.00 bn by the end of 2022. 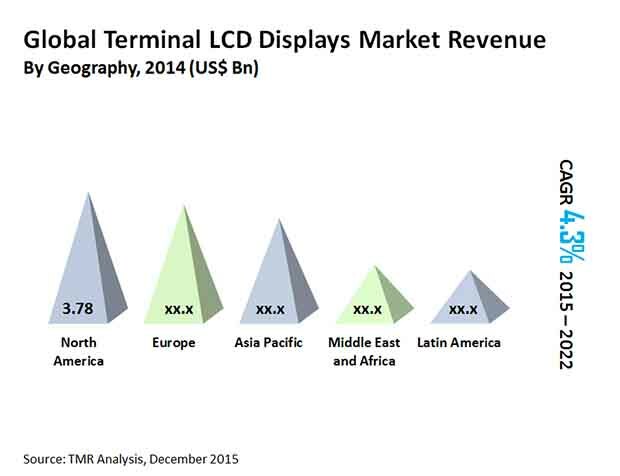 The global market for terminal LCD displays stretches across Europe, Asia Pacific, North America, Latin America, and the Middle East and Africa. Among these, North America has emerged as the leading regional market. In 2014, it accounted for the leading share of nearly 30% in the overall sales of these displays across the world. The opportunity in terminal LCD displays in North America is expected to expand at a CAGR of 3.70% during the period from 2015 to 2022 and increase from US$3.7 bn in 2014 to US$5.1 bn by the end of 2022. On the other hand, Asia Pacific is likely to register a rapid increase in the sales of terminal LCD displays over the next few years. The increasing demand for these displays in Japan, India, China, South Korea, and Australia is expected to boost the opportunity in these displays to rise at a CAGR of 5.10% between 2015 and 2022 in Asia Pacific. Other regional are also anticipated to witness growing demand for these displays, owing to the rise in disposable income of consumers. Siemens AG, Honeywell International Inc., GE Healthcare, Johnson and Johnson Services Inc., Schneider Electric SE, and Koninklijke Philips are the leading players in the global terminal LCD displays market. American Industrial Systems Inc., Bosch Rexroth AG, Mitsubishi Electric Corp., Rockwell Automation, Omron Corp., Medtronic, Baxter, Novartis International AG, Control4 Corp., Toshiba Corp., Fujitsu Ltd., and IBM Corp. are some other prominent participants. This report aims to provide a comprehensive strategic analysis of the global terminal LCD displays market along with revenue and growth forecasts for the period from 2013 to 2022. Increasing demand for LCD displays in the consumer goods and healthcare sectors, technological advancements driving the consumption of high-quality displays, and reducing prices of LCD displays are major factors influencing the terminal LCD displays market. LCD displays comprise a large number of picture elements, which include liquid crystal molecules that are held between two sets of transparent electrodes. TFT and monographic LCD displays are the two types used today. The thin-film transistor (TFT) is an LCD display that uses thin-film transistor technology. TFT technology has been used by OEMs in many products to enhance color, contrast, and picture quality. As TFT LCDs are available in a wide range of sizes, manufacturers prefer this technology in large displays with requirements for good color quality, such as human machine interface (HMI) applications. This research study on the global terminal LCD displays market provides a detailed analysis of how the healthcare, industrial automation, healthcare, and retail sectors in different regions use these displays to enhance visual experience. The report offers an in-depth study of the market drivers, restraints, and growth opportunities. Using these factors, the report identifies various trends expected to impact the market during the forecast period from 2015 to 2022. The report includes a comprehensive coverage of the underlying economic, environmental, and technological factors influencing the terminal LCD displays market. It provides the competitive landscape of key players in the terminal LCD displays market in order to highlight the state of the competition therein. The report also provides a detailed competitive analysis of the key players in the terminal LCD displays market and identifies the various business strategies adopted by them. The study explains the penetration of each market segment within various geographies, and how these segments have accelerated the growth of the terminal LCD displays market. On the basis of type, the terminal LCD displays market is segmented into discreet and surface-mounted LCD displays. Based on technology, the market is segmented into TFT LCD displays and monographic LCD displays. Furthermore, on the basis of applications, the market is segmented into medical equipment and diagnostic products, HMI industrial products, home automation products, and retail sector products. Key products considered in the medical equipment and diagnostic products segment are diagnostic imaging products such as CT/MRI systems, X-ray systems, PET systems, ultrasonography systems, and endoscopes; treatment medical devices such as respirators, defibrillators, patient monitors, and injection pumps; detection analyzers, such as blood pressure meters, diabetes monitors, thermometers, and analyzers. HMI industrial products include industrial PCs, HMI touch panels, operator interface terminals, rugged touch panel computers, and small-sized panels. The home automation application segment includes navigator touch screen panels, media and security smartpad panels, and thermostat controller panels. Moreover, the retail segment covers handheld terminals, display kiosks, electronic shelf labels, and other products such as cash registers, barcode readers, weighing scales, and currency counters. The report aims to provide a comprehensive, cross-sectional analysis of the terminal LCD displays market across the major geographies of North America, Europe, Asia Pacific, the Middle East and Africa, and Latin America. The report includes an overview of the market strategies, annual revenues, and the recent developments of key companies operating in the market. The key market participants profiled in this study include Baxter International Inc., General Electric Co., Johnson and Johnson, Medtronic Inc., Siemens AG, Novartis AG, Koninklijke Philips N.V., American Industrial Systems Inc., Bosch Rexroth Group, Mitsubishi Electric Automation, Omron Corporation, Rockwell Automation, Schneider Electric SE, Crestron Electronics, Inc., Control4 Corporation, Legrand, Casio America Inc., Toshiba Corporation, NCR Corporation, Hisense Group, Sharp Electronics Corporation, Fujitsu Ltd., and IBM Corporation.